“Well, I’ll be!” Rolf Valtin ’48 proclaimed as he opened his front door to welcome a small contingent from the Swarthmore College Department of Athletics. The purpose of a fall visit to Valtin’s home in Alexandria, Va., was to present him with a plaque honoring his induction into the Garnet Athletics Hall of Fame (due to ailing knees, he could not travel to the induction ceremony Oct. 4). A three-sport athlete and a star of Swarthmore’s soccer team, Valtin earned All-America honors three times during his career. 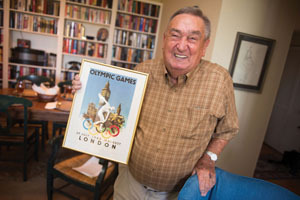 A successful athletics career at Swarthmore is just one small part of Valtin’s personal story—one that, due to a clerical error, remained hidden in plain sight for 70 years. In 2011, during the nomination process for the Garnet Athletics Hall of Fame, an alum notified the athletics department of a mistake in the online edition of the men’s soccer career record book: Two players listed in the book, Rolf Wiegelmesser and Rolf Valtin, were actually the same person. The statistics were combined, and, mix-up aside, the newly established “Rolf Valtin” had a solid argument for induction into the Hall of Fame. What no one in the athletics department could have anticipated was that a closer look into Valtin’s background revealed a fascinating, almost unbelievable personal story. With his wife and college sweetheart Nancy Eberle Valtin ’47 at his side and the contingent from Swarthmore all ears, Valtin explained that he came to America—a German immigrant of Jewish decent—with his two brothers and mother when he was 13. Their mother’s contacts with Quakers in America helped the family escape just a few months before the Reichskristallnacht, while their father remained in Nazi Germany. Quakers in the Philadelphia area provided housing and schooling at George School in Newtown, Pa.
George School propelled Valtin and brother Heinz ’49 to Swarthmore. Soon after setting foot on campus, Valtin became an athletics standout in varsity soccer, baseball, and basketball. In 1943, after just one year at the College, Valtin was drafted into the U.S. Army and forced to leave school. Because of his German heritage, he became an interrogator for the 16th Regiment of the 1st Infantry Division. June 6, 1944, the 16th Regiment helped lead the assault on Omaha Beach during the Normandy invasion. His time in the Army also explained the name change that led to the initial confusion. “Our father was still in Germany, and the thought of being captured with the name Wiegelmesser was uncomfortable.” He also admitted that Wiegelmesser “was a pretty awkward name and wasn’t difficult to shed,” which drew a thankful smile from his wife. 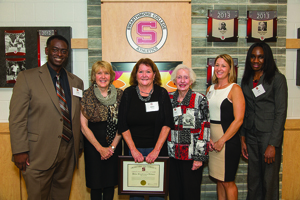 Joining Valtin in the 2013 Hall of Fame were, from left: Ed Greene ‘85; Jeanne Gibson ’78 and Barbara Gibson ’71, representing Helen Tomlinson Gibson ‘41; Joan Faulkner, representing Ed Faulkner; Julie Noyes LaFramboise ‘95; and Imo Akpan ‘02. Returning to the College in 1946 to finish his degree, now as Rolf Valtin, he resumed his standout soccer career, netting a then-program-record 11 goals his senior year, including four in a shutout of Princeton. His strong play during his senior season led to a tryout for the 1948 U.S. Olympic soccer team. While admitting that soccer “was not a national sport in America” at the time, he shined through a series of tryouts to join the team that went to postwar London. He is one of the few Swarthmore alums to participate in the Olympics. Although the Americans had little success at the Olympic games, they won a post-Olympic exhibition against the newly formed state of Israel. Valtin tallied one of the goals. At 88, Valtin remains active and profoundly sharp, only recently retiring from a long career as an arbiter of labor disputes—a career that he says was sparked by a labor economics class taught by Frank Pierson ’34. At every opportunity to boast about his amazing life and accolades—Valtin declined, instead praising others, especially those who helped shape his life—including the College. “Swarthmore would not have been the same for me without sports,” he said. “I was active in every season. I loved it. It gave me a certain stature that I would not have had. To watch a video of Rolf reflecting on his life, click here.